UMB Healthcare Services leads the industry with its HSA education toolkits that simplify implementation, enrollment, and ongoing education. UMB Healthcare Services, a division of UMB Financial Corporation, delivers services for health savings accounts (HSAs) and private-label multipurpose debit cards to employers, banks, insurance carriers, third-party administrators and software companies. The firm moves beyond traditional banking by offering HSA education to help individual customers maximize their accounts to achieve greater financial security. 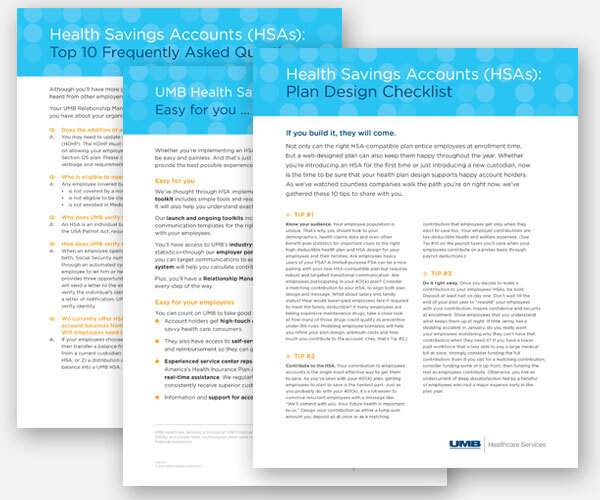 In 2010, we partnered with UMB to create the most comprehensive suite of HSA communications toolkits in the industry—featuring detailed advice and ready-to-use templates to help employers make the shift to HSA plans. Since then, we have developed thought leadership work with UMB, centered around a deeper understanding of how to help individual employees succeed with HSAs and how to make employers effective with their consumer-driven plan designs. We collaborate with UMB on ongoing thought leadership work, from research to webinars. We also craft UMB’s quarterly HSA statements, so that accountholders receive a simple, but people-focused touch to using their accounts. 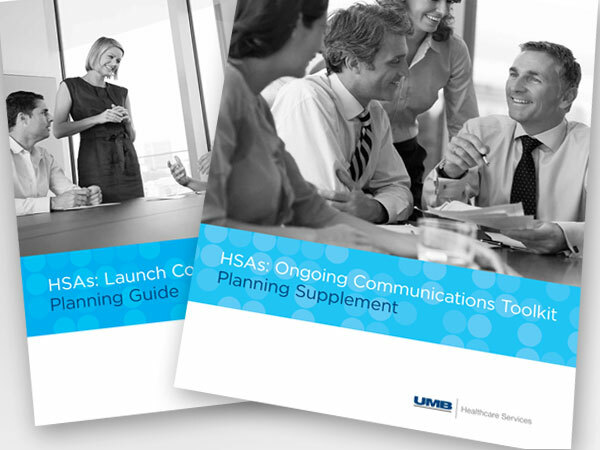 We partnered with UMB to create the most comprehensive suite of HSA communications toolkits in the industry—featuring detailed advice and ready-to-use templates to help employers make the shift to HSA plans. 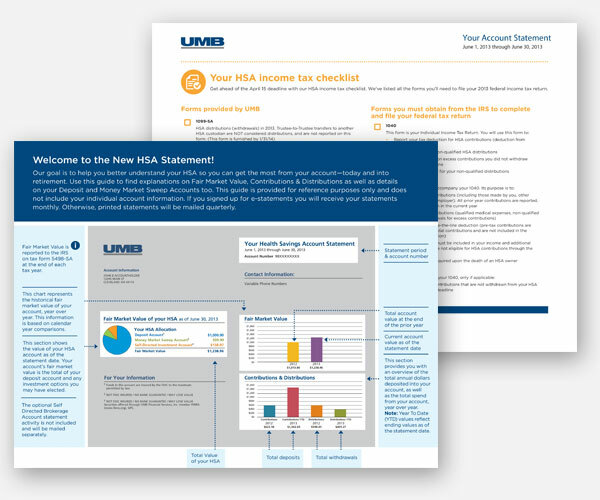 We also craft UMB’s quarterly HSA statements to give users simple, actionable direction for maximizing their accounts. We’re so excited to be able to share such high-quality resources with all of our business partners. It was a pleasure to work with the Benz team in conceiving and building not only the toolkits, but all of the support resources that go along with them. They really set a new industry standard for giving employers and individual account holders the information they need to be able to manage their well-being—all for free. Planning guides walk employers through every step of creating an effective benefits communication strategy: understanding their audience, crafting key messages and identifying success measures. They also include a sample communication timeline to map out what to send employees, when to send it and how to use the templates. The customizable templates include everything employers need to create an engaging annual enrollment campaign: blog articles, postcards, emails, two video scripts with slides, two presentations with speaker’s notes, FAQs, enrollment guide copy and a tip sheet. All companies need to do is fill in their plan details. In addition to being named to Forbes’ list of America’s Best Banks for six consecutive years, UMB also has the distinction of being ranked first by Celent for its consumer services. UMB CEO Dennis Triplett is a sought-after thought leader, presenting annually at multiple financial and benefits industry events. He also was honored in 2013 with the Institute for HealthCare Consumerism CEO Leadership Award, which recognizes CEOs who embrace and support health care consumerism and display innovative programs in health and benefits management.